I met Michael Fitzgerald in 1970 when a group of us sat in a chilly Earlham College auditorium singing old folk tunes to the chords of a dulcimer. It was at Earlham that Michael Fitzgerald found his poetic voice, a voice he has worked hard to refine over a lifetime of diligent practice of the art of poetry. For almost five decades, Fitzgerald has been faithful to poetry, writing prolifically and with a deepening awareness of both the outer world and his own inner struggle. The result is a sometimes joyful, sometimes painful, and always moving body of work. His wholehearted acceptance of the teachings of Bahá’u’lláh, which he also discovered at Earlham, has served to focus his concerns in that work while his developing craft has derived inspiration from Walt Whitman, whose voice is heard in the grace notes of Fitzgerald’s work, and from Emily Dickinson as well as Robert Hayden. While his work is infused with the positive vision of the Bahá’í Faith, with its confident assertion of the ultimate oneness of all peoples and religions, Fitzgerald does not shy away from the challenges of the process that will bring humanity to embrace such a vision. He sings his song with the same heartfelt compassion, practiced skill and trust of process found in the best jazz musicians. Music inhabits much of his work and not just in the artful use of cadence and inner rhyme. Each word labors to reach some new understanding. The reader hears the human voice singing as well as orchestral music and jazz. Fitzgerald writes of Dizzy Gillespie, of Doc Holliday, and of the roots of jazz. In his poems, strangers sing the blues in cafes and brass quintets transport us. There is “one song, one chord, one chant,” he affirms, and the entire planet participates in the “heuristic hum.” Fitzgerald’s poems spend a lot of time in diners: good food and coffee are always on the menu where Jo-Jo is the waitress, the juke box is hot, and new friends share their love as well as bagels. The end result is a poetic vision in which world music is more than notes on a page and food more than physical sustenance. Fitzgerald’s earliest published poems, from the ‘80s, offer snapshots of a younger man who was often ill and still learning that art could be “a stretcher to wheel in the wounded.” I’m grateful for these early poems, as full of words as they are. While they are a younger man’s poems, they hold the promise of a tighter, more concise voice. In the poems of “New World Suite,” which appeared in 1990, Fitzgerald pares down his work, so that the spaces between the notes show through. Between 1990 and 2015, he published eight book length collections of poems, along with books for children, various chapbooks and three collections of literary work by writers in the worldwide community of artists in which he had found a home. And he did all of this on an IBM Selectric, editing with a ball point pen. Rarely traveling far from the Shenandoah Valley, over the decades he has written with the urgency of one who is fully aware that a lifetime might not be long enough to say all the things that need to be said. In a poem entitled “Dust of the Heart,” Fitzgerald communicates that urgency, drawing on a Whitmanesque sparseness to convey both the beauty and the messiness of the inner struggle: “In the primary dust/ of the human heart,/ where we learn of ourselves,/ break ourselves and become,/ I go in each day to do/ a bit of cleaning....” (Holy Passions, 1998). yes to the inexorable drive toward peace. 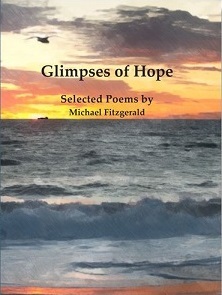 Glimpses of Hope is Michael Fitzgerald’s own distillation of a lifetime of work and will likely be the best place to read a representative sample of his poetry. 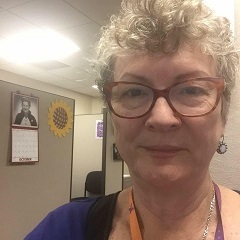 Bio: Rhonda Palmer is a hospice nurse, a grandmother and a lover of poetry who lives and works in Ann Arbor, Michigan. Her most recent project is a retrospective of the work of poet Richard W. Thomas, to be released in April 2019 by Hopeful Press.